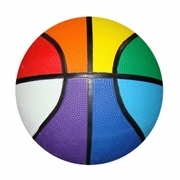 Regulation size and weight, nylon wound, regulation size #7 This is a #7 Regulation size and weight basketball. Circumference between 29.5-30 inches. It weighs 20-22 ounces, and has a diameter of 9.39 inches. It is made of wound nylon. Basketball, in gay pride rainbow colors. Comes deflated, you'll have to inflate with air with air needle (not included).